Commentary by Writer & Director George Tillman, Jr. 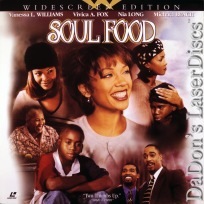 Soul Food 1997 - 115 min. - Color Genre: Comedy Rated R Country: USA LaserDisc Movie Storyline: SOUL FOOD is a warmly atmospheric ensemble drama set around the abundant table of Chicago family matriarch Mother Joe, whose extended brood orbits around the stabilizing force of her sumptuous Sunday dinners. However, when dissent brews between competitive sisters Maxine and Teri, grandson (and narrator) Ahmad tries to reunite the family. This moving film, written and directed wonderfully by George Tillman Jr., features excellent performances from Vanessa L. Williams, Vivica A. Fox, Nia Long, Irma P. Hall and the rest of the talented cast.